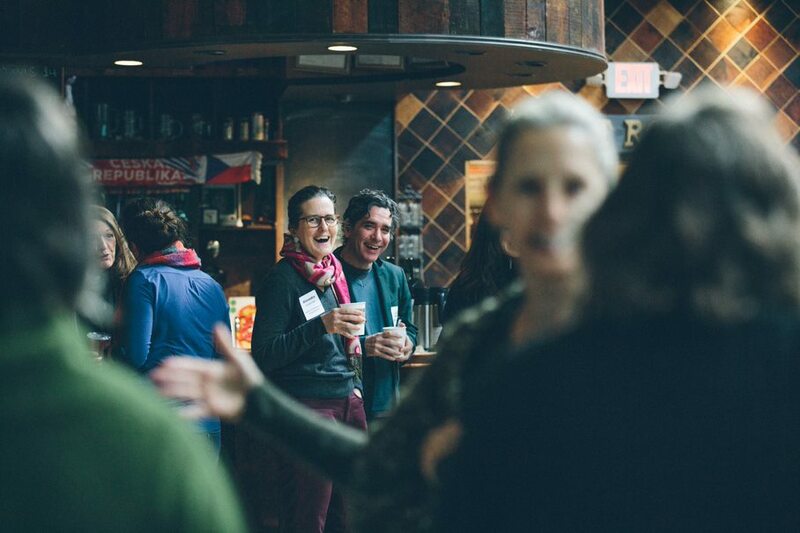 HOLYOKE—Eyes were sparking, smiles flashing on a pleasant Saturday morning in January as more than 80 ambitious representatives of the Valley’s creative community gathered and got caffeinated at Gateway City Arts. Anticipation riffled through the room as the who’s who of executive directors, board chairs, artistic directors, presidents, CEOs, founders, marketers, programmers and volunteers affixed their name tags and leaned in as they settled at crowded tables around the large room. The Arts Co-Creator colloquy of arts presenters, theatre-makers, music-makers, visual artists and other makers marked the beginning of an experiment in nuclear fusion. 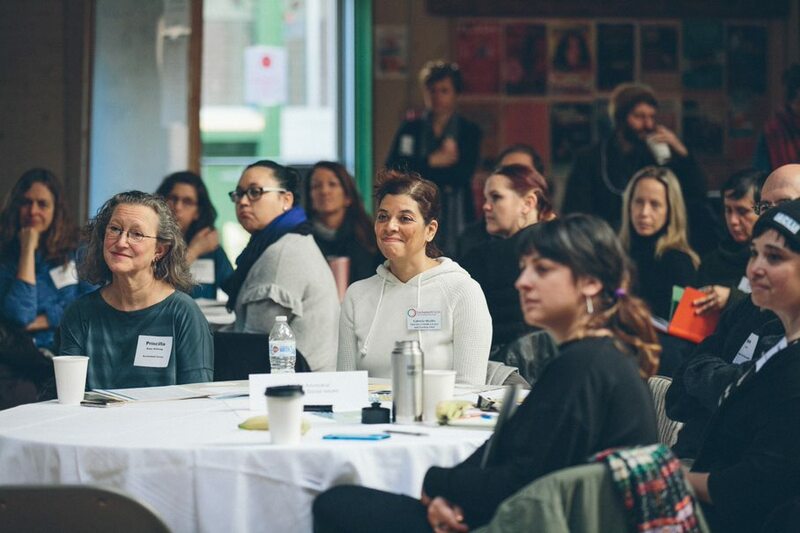 The Community Foundation of Western Massachusetts, fueled by Boston’s well-heeled Barr Foundation, is turning up the heat on its ValleyCreates initiative. They are offering $80,000 in grants to artists and organizations—in minimum groups of three—to plan collaborative arts projects, releasing energy with impact throughout Hampden, Hampshire and Franklin counties. Fusion reactions require high heat, and Zobel allowed that the Community Foundation is not known for being hot on the arts. But, she noted, it has developed community-building tools and community trust over its 28 years of grant-making. The Barr Foundation, whose arts & creativity maven E. San San Wong was on hand, is tapping into these assets as part of its temperature-raising $3 million Creative Commonwealth Initiative to excite arts and creativity across Massachusetts. The Community Foundation is one of five organizations throughout the state being funded and mentored to take part in the initiative. Zobel noted that arts folks are willing to take risks and bring different perspectives to the table(s). For those who believe in the transformative power, the attractive force of the possibilities for collaboration was strong, the temperature was right, and everyone seemed at least open to putting their nuclei into the collaborative fusion reactor. “Wow,” I thought, “we might have some real explosions,” noting to myself that the granting process will still be competitive, not all applications may be funded and real people, not abstractions are in the room. As the Community Foundation’s community advisers, program officers and facilitators stepped up to the microphone, they laid down the predicate for the day and the structure for the interactions to come. Any imminent fusion reactions were taking place in a controlled environment. Not to worry. The only palpable tension in the room was creative—a desire to get on with the show. The activities for the gathering were grounded in serious preparation by the organizers in properly framing their intent. 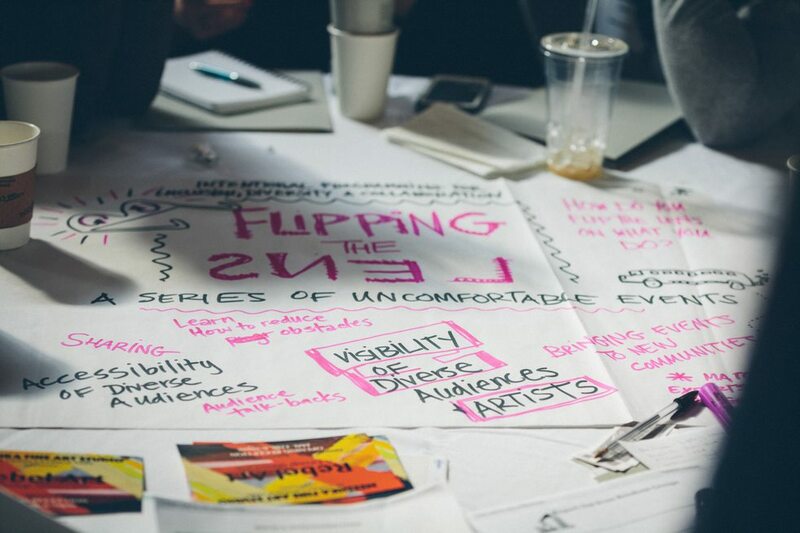 That prep included input from the creative community and careful organization to provide a framework for brainstorming projects with clearly articulated objectives—strengthen connections, foster collaborations, promote inclusivity/celebrate diversity and create meaningful change in the Valley through the arts. To pursue their inventions, attendees had chosen their breakout discussions, seated about eight to a table in broad areas of focus drawn from their responses to a survey. As the inventing began, I listened in on the sharings, reflections, dialogues, proposals and visions percolating throughout the room. At the “More Connected Region” table, the conversation started with how disconnected communities throughout the Pioneer Valley can be — by race, by geography, by class mindset (the “tofu curtain” was referenced). Can these disarticulated communities share in the creation of art that would both express their individual identities and open windows onto each other? The idea coalescing was a multi-site mural project, produced with purposeful community engagement. At the “Festivals and Multi-Disciplinary Events” table, steam was gathering around a multimedia traveling festival with a coherent identity. It could be a festival of events happening through the Valley during one timeframe or a moveable festival happening annually in a different Valley community. One dreamer cited the need to overcome the perception by many Valley-dwellers that “20 minutes is too far to drive.” People nodded when someone brought up the lack of accessible public transportation. When I checked in on the “Cross Pollinating Audiences and Spaces” table, the discussion was revolving around audience development and the permutations of connecting: venues looking for programming with presenting organizations looking for spaces; venues with venues; artists with arts organizations; arts organizations with artists organizations… The momentum was around expanding exposure and expanding audiences. The suggestion of an Audience Pass—one ticket to access multiple performances/venues—came up. The discussion around “Raising Up Voices for Diversity and Inclusion” generated the idea of “flipping the lens” through art that “mirrors diversity in the community back to the community.” There was talk of presenting “a series of uncomfortable events” that put marginalized people at the fore and take audiences out of their comfort zones. For example: artists with mental illness leading an event, a Spanish film festival with English subtitles. The ideas of the day only suggest the projects that might be proposed for ValleyCreates funding for collaborations. The process is open-ended and any collaborative idea the creative community generates can be considered for funding to support the planning stage. The only stipulation is that the lead agency in any collaboration must have participated in this seminal event. After this energetic flame-fanning, will the Valley’s creators and presenters actually partner up and present “fundable ideas?” “One group went to a bar after the event to continue talking about their idea,” Ayres observes to me with an audible twinkle. ValleyCreates program officer Nicole Bourdon reports that she has had follow-up contacts with several prospective collaborations and expects more. She has conducted one of the required pre-application phone calls—intended to provide initial feedback and answer questions—and is scheduling others. Ayres anticipates nine or more proposals. Karen Finn, executive director of the Springfield Cultural Partnership, gives the event a thumbs up for potential. “It was successful in strengthening connections and making new connections,” she says. 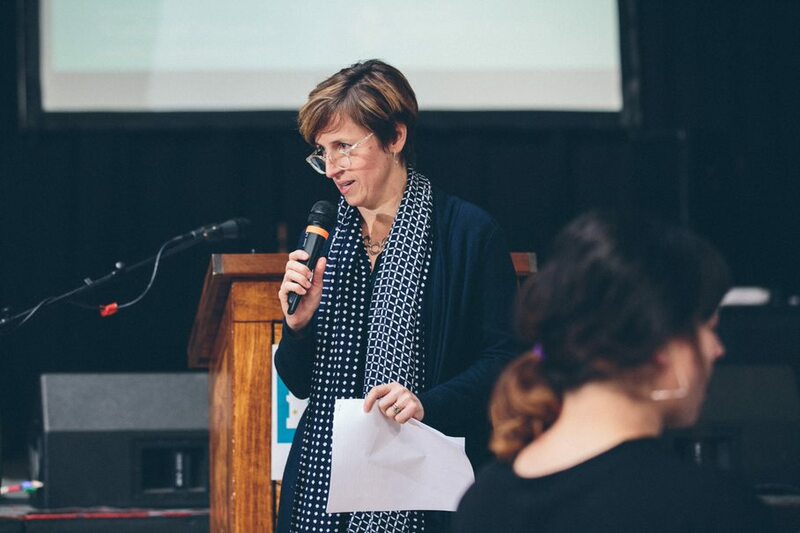 “People had to shift the way they might have come in thinking – to work with a group on a topic they might not have been thinking about.” Finn says she wants to engage ValleyCreates grant opportunities by facilitating the participation of the city’s less high-profile and less-experienced artists and organizations. Many of the arts organizations in the Valley are small, rely heavily on volunteers and are not flush with resources, financial and otherwise. So, the application process for the ValleyCreates grants has been adapted with this “daunt” factor in mind. Especially innovative is that application is via video submission. Smartphone video is fine. According to program coordinator Bourdon, “We’ve tried to make the applications as simple as we can, we’ve stripped them down so that organizations don’t get tripped up on the red tape that it takes to make applications.” Some of the usual financial requirements have also been removed. Hellweg notes that even more experience and resourced organizations like Enchanted Circle Theatre will have to stretch to take on a ValleyCreates grant. “I am enthusiastic but also realistic,” she says. “Collaborative grants take more time, more coordination. There are a lot of moving parts.” In fact, one potential institutional partner she has reached out to after the event has told her they just can’t free up the capacity for a new collaboration. Of course, the Arts Co-Creator gathering may bear fruit in other ways and other seasons. New Music Alliance’s Sherry told me about meeting Rachel Odo of Lyra Music. Lyra hosts young musicians at Smith College each summer in a conservatory-style classical music workshop and festival. Sherry says that classical and popular musicians don’t often mix and that young classical musicians have resources like Lyra. “There’s no comparable organization that does anything like that for musicians on the other side,” he says, hence the New Music Alliance’s aspirations for popular musicians and his interest in engaging with Odo. “I told Rachel we should talk,” he says. “We might be able to work something out”— something more modest than stepping up for a ValleyCreates-level collaboration this year. It’s not a simple linear equation. During the gathering, the representative of one presenting institution in Northampton noted that its audiences are almost exclusively white, even though she feels they were presenting diverse programming. Iohaan Vega works with youth in Holyoke for the social service agency Gandara and produces/hosts a community media podcast, Radioplasma.com. His take: “The perception and awareness of diversity as a need is there, but there is not yet a strategy or a plan on how to get it done.” The conversations at the January confab were “a good start,” he says. In a nuclear fusion reaction, high temperatures and powerful attractive forces must be generated to join naturally repulsive positive nuclei together. The hydrogen bomb is evidence that scientists can generate the heat and forces necessary for an uncontrolled explosion, but sustaining these forces indefinitely to generate useful energy has proven elusive. In the inherently collaborative business of presenting artistic endeavors, we can check the box for the attractive force: organizations will enjoy being supported for working together on multi-partner projects rather than competing for scarce resources. 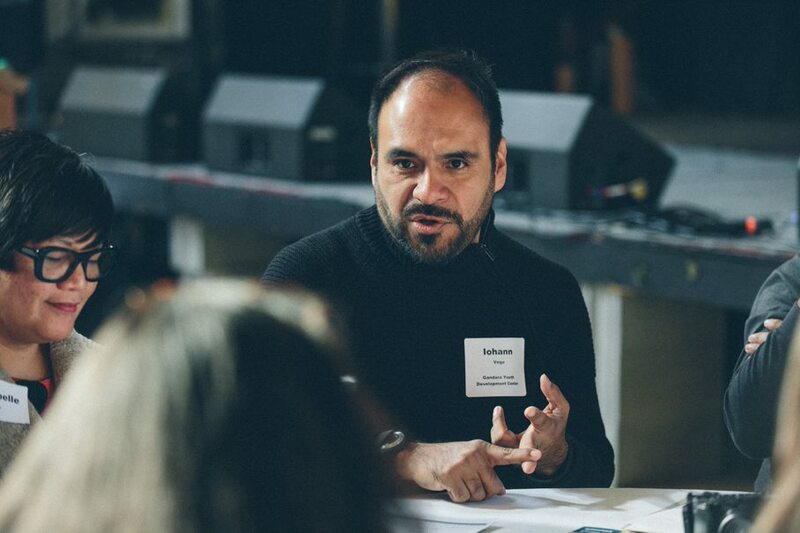 In the challenging business of finding money for creative endeavors, the ValleyCreates grants stand out for creating higher temperatures by funding to incubate, rather than produce, a project. As the Community Foundation’s Ayres puts it, “There’s no product we’re asking for other than that people come together and plan.” Grantees will have four months to plan from May 1 to September 1. Grants will range between $5,000 and $10,000 depending on the complexity of the project. And there’s more: To release the energy of the grant planning, more ValleyCreates funding is lined up to fuel the actual projects in 2020. It’s clear that one or two funders can’t sustain high heat indefinitely. “As the projects take off and have impact, the hope is that others will take notice and bring resources to the table to allow this kind of synergy to continue to happen,” says Ayres. Bourdon adds that the Foundation plans to launch a “co-investment platform” online for investors and funders in the community to see and tap into the projects. Sustainable, community-based arts & creativity power throughout the Valley? Here’s hoping.